NEW YORK, N.Y., May 31, 2011 (SEND2PRESS NEWSWIRE) — BidYourCase (www.BidYourCase.com) is a revolutionary concept that matches clients to lawyers online. Through the ease and convenience of the Internet, clients seeking legal representation can express their needs, receive offers from highly qualified lawyers, consider which factors they consider most important (price, location, rating, etc.) and select a specific lawyer to handle their case – all within 72 hours. The service is completely free, and it aims to redefine the relationship between lawyers and clients in a mutually beneficial way. BidYourCase was founded on two simple, yet defining principles. The first is the defense of social justice – to help individuals stand up for their legal rights by reducing the worries generally associated with selecting a lawyer (studies conducted found that the primary barriers are “fear of unknown costs” and the complexity of the selection process). The second principle is the accessibility of representation – to reduce the anxiety that comes with meeting lawyers. BidYourCase also strives to assist private lawyers, small law offices, and lawyers wishing to increase their Internet presence. Not only do lawyers get to bid on cases that they are best suited to try, but they also get a steady flow of prospective clients without having to pay for leads. By simply signing up for BidYourCase, lawyers will increase their scope of influence and generate more business. BidYourCase is built upon an advanced back-end system developed specifically for the website and is based on an artificial intelligence system that is able to characterize and classify clients’ requests, quality and credibility. It then matches a client to relevant lawyers in close geographic proximity. The software developed for the website is based on a unique registered patent. Established nearly two years ago, BidYourCase won a start-up competition (Tech Aviv, New York) and worked to raise seed money. Mr. Roni Einav, who founded over 25 venture investments, including Liraz Computers (became public on TASE) and New Dimension Software (became public on NASDAQ and was acquired by BMC Software via a $675 Million cash transaction), became BidYourCase’s lead investor. Daronet Ltd, the leading web developer in Israel, is the most recent company to invest in BidYourCase. Daronet Ltd has helped BidYourCase develop unique, cutting-edge technology that transforms the complex world of legal service into a user-friendly application. For details, please see http://www.bidyourcase.com . 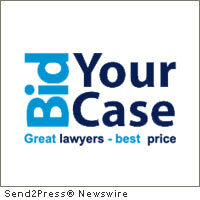 Original Keywords: Bid Your Case, BidYourCase, matches clients to lawyers online, Edo Ohayon, find a lawyer online, Tech Aviv, Roni Einav, Daronet Ltd, startup, legal, lawyer, lawfirm, portal, directory, locate, engage BidYourCase New York New York NEW YORK, N.Y.
REFERENCES: Business News, Bid Your Case, BidYourCase, matches clients to lawyers online, Edo Ohayon, find a lawyer online, Tech Aviv, Roni Einav, Daronet Ltd, startup, legal, lawyer, lawfirm, portal, directory, locate, engage BidYourCase New York New York NEW YORK, N.Y.